Rod floors are a great training aid for gymnasts and cheerleaders. They are stiff enough for your bigger athletes, but soft enough to help younger/smaller athletes too. Coaches find that this floor increases the learning capabilities of their athletes which allows them to progress faster. They are common in Gymnastics, Cheer and Tumbling facilities across the US. 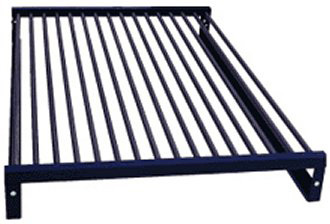 The tubular fiberglass rods ensure a fantastic amount of spring with increased safety. Sold in 4’ X 6’ sections and covered by two pieces of carpet bonded foam (not included in rod floor cost). The rod floor units (without foam) are 8” tall when assembled. These floors are also used in the sport of Power Tumbling. Where tumbling is performed on these elevated spring runways that help tumblers propel themselves higher than a basketball goal as they demonstrate speed, strength and skill while executing a series of acrobatic maneuvers. Top-level contenders will perform explosive somersaults with multiple flips and twists. Top-level contenders will perform explosive somersaults with multiple flips and twists. Coaches and gymnasts appreciate this rod floor because it offers a phenomenal amount of spring, it decreases injuries, no maintenance is required, and it is very easy to set up. A Competition Size Rod Floor is 84 feet (21 sections). Rods are covered by a layer of Carpet Bonded Foam (1 3/8") over a layer of 1.875" to 2" (50mm) polyethylene (aka Trocellen) foam with scrim. The Scrim side is placed directly on the rods for these floor. The scrim will prevent the rods from chewing up or tearing up the bottom of the foam. You can make yours a custom length if you like (divisable by 4'). Carpet and foam not included in pricing below. 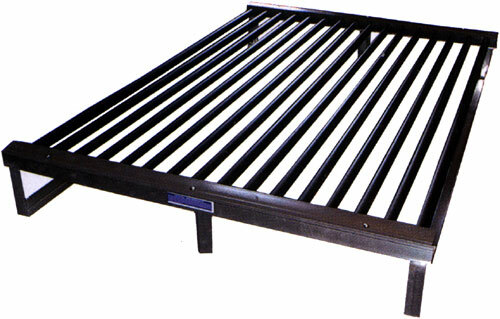 We offer our customers two choices for Rod Floors -- The FSG Rod Floor and The Ross Rod Floor. They are priced the same, the FSG (with the aluminum frames) are usually cheaper to ship. The Ross Rod Floor also has significant assembly to be done once received. FSG Rod Floor sections are constructed with lightweight aluminum frames for shipment and transport and strong fiberglass rails for maximum air. Sections are 6’ Wide and 4’ Long. Use hook fabric strips to secure carpet bonded foam to the rod floor, and link the rod floor sections together. Units come fully assembled, you just need to set in place and attach to adjacent unit. Each section weighs about 100 lbs. Each aluminum frame section is 8" (20cm) high, 6' (1.8M) wide and 4' (1.2M) long. No assembly required. Just attach each 4' segment to the next with provided velcro. One-year warranty. May take 4 to 6 weeks to ship. The Ross Rod Floor is the tumbling track floor recognized by the Federation of International Gymnastics. 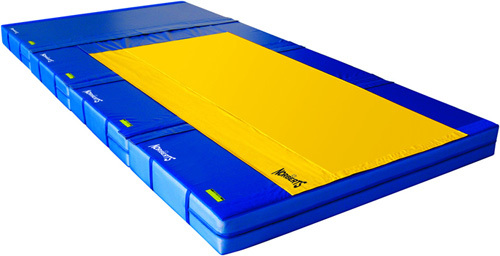 It is a FIG approved tumbling track used at all United States Gymnastics Trampoline and Tumbling sanctioned events (USAGTT) and United States Tumbling and Trampoline Association sanctioned events (USTA). Some assembly required upon receipt. Easy to replace worn or damaged parts. You will need a 3/4" socket wrench and a crescent wrench (and gloves) to assemble the rod floor sections. Tubular fiberglass rods ensure no lock-up when tumbling. Assembly of each unit is required. Each steel frame section is 8" (20cm) high, 6' (1.8M) wide and 4' (1.2M) long. Two-year warranty. Usually ships quickly - (within a few days of your order). Both of these Rod Floors are made in 6 ft. wide x 4 ft long sections and sixteen 1" fiberglass rods spaced evenly across the top. The rods are covered with a thin flexible covering that helps keep the fiberglass away from your foam products. The rods will each withstand greater than 6,000 pounds per square inch of force. 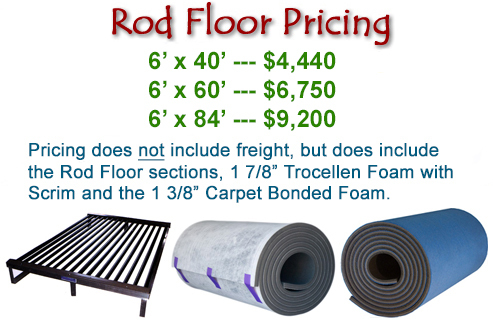 Rods are typically covered by a layer of 1 3/8" carpet bonded foam, over a layer of 1.875" Trocellen foam with scrim. You may also want to consider the option of a vinyl floor skirting for the perimeter. Tip: When comparing rod floors, be sure that there are 16 rods per 4' section and the rods are 1" diameter. When less rods are used it is harder on the foam and will wear out sooner. These sections sell for $325 per (6' x 4') section plus (motor freight) shipping. A competition size rod floor, though, is 84 feet (21 sections). Request a delivered price here. The pricing above does not include a dismount mat. The regulation size for a dismount mat for competition is a 10' x 20' x 12". If you plan to put on a competition you will need that size. Most gyms, however, don't have the room (or budget) for this size and commonly use a 6' x 12' x 12". This mat will not be competition size or have an landing zone, of course, but it is an inexpensive alternative when used for training. See it listed here. With Norbert's Rod Floor Landing System, you can purchase the Dismount Mat in sections to make it easy to increase the size as your budget permits. See more information on it here. To request a delivered price on a dismount mat, use the (above) request form, just mention which dismount mat you would like quoted (if any) in the text area of your request.